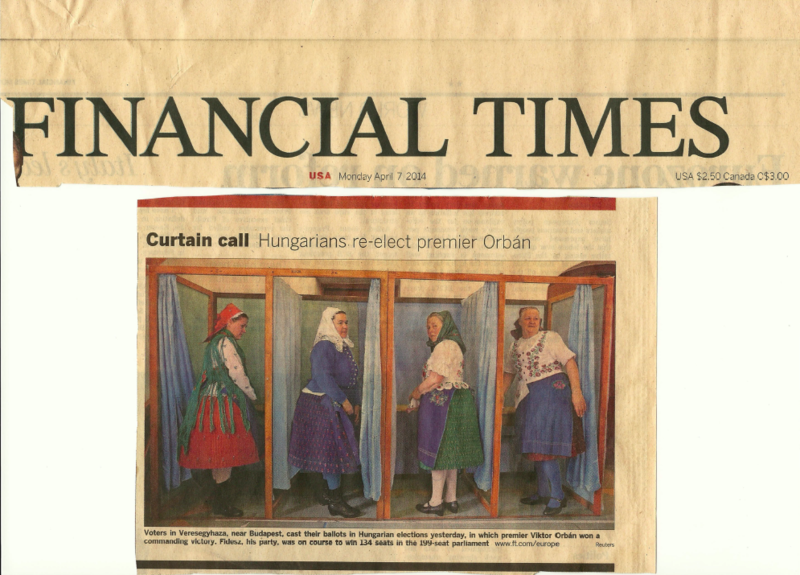 On Monday (4/7) the Financial Times reported pictorially on the elections in Hungary. To provide a vivid image, the front page of the paper chose to show four women in native (and perhaps medieval) garb. Our first thought was that we were looking at four strange Barbie-dolls in their colorful little boxes. Such a presentation of the Hungarian election process is not only inappropriate but absurd and misleading. First off, Hungarian women go to work and fulfill their civic voting duty dressed in business attire, some even wear pants! Also, although not in evidence in your picture, Hungarian men vote as well. The FT photo very much gave the impression of Hungary being a third world outdated country. One could think that the reason for this front page picture is the fact that Mr. Orban has again obtained endorsement from the voters. Could it be, that the view of the Hungarian ‘ancients’ at the ballot box is designed to connote support by old fashioned folks only? Or was this the work of an untrained press office? The photo tactic is inaccurate and inappropriate. Just because some of Hungary’s neighboring EU nations are dissatisfied with the directions of its government, should not lead to derisions of the democratic process of voting. This info graphic illustrates the jump in the use of social media in China during the past years. The two main concerns when selecting advertising media are reaching the appropriate target audience and doing so efficiently as measured by the cost per thousand (CPM). If the company is in a position to define a target audience clearly in terms of demographics or product-related variables, the media choice will be easier. The more targeted you can become when describing the most likely customer, the easier it is to identify what they read, watch, or listen to or how to reach them through their key influencers. Do not make decisions by CPM alone, though. 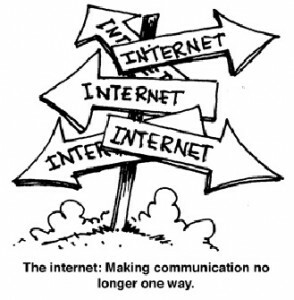 With an integrated marketing communication mindset, media work synergistically. For example, advertisements in publications and directories might drive customers and prospects to a website, while publicity can educate about a product category and advertising provides brand-specific information. As in the U.S., international advertising vehicles include business and trade journals, consumer magazines, broadcast media outlets, the Internet, and directories. Media availability and spending may vary dramatically around the world, with the U.S. spending more money on advertising than most other advertising nations combined. According to ZenithOptimedia, the fastest growing region includes Central and Eastern Europe while Latin America is seeing more moderate growth in advertising spending. China and Russia are moving up on the list of largest advertising markets, with China estimated at fifth place in 2008 and Russia expected to be in seventh place by the end of 2009. How and where they money is spent varies, too. Some Latin American nations have the heaviest concentration of their advertising in television, while print media dominates in some Scandinavian lands. Cable and satellite enhance TV penetration in affluent markets, while radio remains a strong medium in many developing markets. Outdoor and transit advertising, cinema ads, and the Internet also compete for a share of the marketing communications budget in many global markets. Interactive telephone and TV are on the horizon, too. One of the challenges for the international advertiser is the need for market-specific information. A medium popular in one country might well be significantly less important in another nearby, forcing the marketer to, for example, use radio in one market and print in another, which increases production costs. Currency exchange rate fluctuations also complicate media planning and budgeting. Some of the regional regulations include limits on the amount of time available for ads. In Italy, for example, the state-owned and commercial TV channels have different maximum advertising limits. 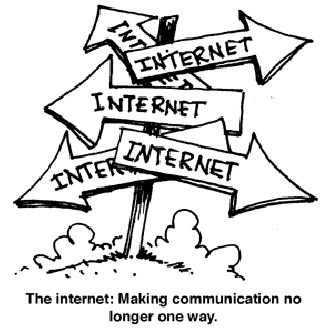 Other regulations affect how content is presented. In Italy, unlike the U.S., there is a strict separation between programs and commercials. Many countries restrict gender stereotypes and comparative claims. Thanks to cable and satellite transmissions, the media in neighboring countries is increasingly crossing global boundaries, generating significant implications for global marketers. The viewer’s choices have expanded, leading to competition among government-run public channels, state channels from neighboring nations, private channels, and pan-European channels. As a result, marketers must make certain that their advertising communicates effectively not only in the region where they make the buy but also across boundaries. This makes ad creation and media buying more challenging, frustrating marketers and their advertising agencies. Agencies often must produce several separate versions of a campaign to comply with various national regulations. As in the U.S., tobacco, alcohol, and pharmaceutical products are the most regulated in Europe. Michael R Czinkota and Ilkka A Ronkainen, Global Business: Positioning Ventures Ahead (New York: Routledge, 2011), pg. 124-126.